Independent Directions to this Site: This site is about an hour east of Ottawa. To reach the Alfred Bog from Ottawa, take Highway 417 east 67 km to County Road 9 (exit 51). Head north 11 km on 9 through St. Isidore de Prescott to Franklins Corners and County Road 16. Turn right and follow it east 3 km to Fournier and County Road 15. Turn left onto 15 and go north 5 km to Concession 11 Road. Turn right on it and go northeast 3.5 km to the turnoff, on the right, for the boardwalk. 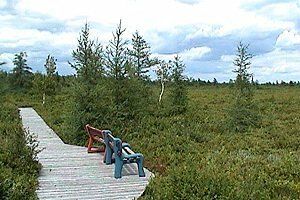 Site Description and Birding Information: The Alfred Bog is the largest boreal peat bog in Ontario south of the Canadian Shield. At over 4,000 hectares (10,000 acres), this domed bog is much larger than Mer Bleue. In 1988, the Nature Conservancy of Canada was able to buy 1,800 hectares of the bog land. Another 1,600 is owned by a Montreal-based company active in the peat-mining industry. The remainder of the bog is owned by another 50 private owners. Currently, the Nature Conservancy has an option to purchase another 1,200 hectares of the bog. With matching grants from both federal and provincial governments, it still requires $820,000 to be raised privately. You can help with even a small tax-deductible donation. Please send a cheque payable to "The Ottawa Field-Naturalists' Club", marked "Alfred Bog Fund", to The Ottawa Field-Naturalists' Club, Box 35069, Westgate P.O., Ottawa, ON K1Z 1A2; or to The Nature Conservancy of Canada, 400 - 110 Eglinton Avenue West, Toronto, ON M4R 1A3. Remember to mark them "Alfred Bog Fund OFNC". A number of the plants and animals residing in the area are considered to be rare, either regionally, provincially or nationally. 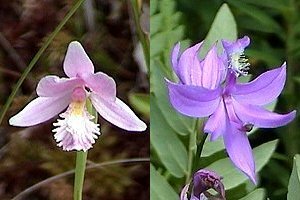 Some such as the Southern Twayblade Orchid, White-fringed Orchid, Atlantic Sedge, Rhodora, Massachusetts Fern, Bog Elfin Butterfly, the nationally rare Fletcher's Dragonfly, and the Spotted Turtle are found either nowhere else in Ontario or in only a few specific locations in the province. In addition, the bog is home to a predator-free moose herd which biologists regard as significant for scientific studies of disease, inbreeding and population control. Regionally rare breeding birds found here are Black-backed Woodpecker, Gray Jay, Palm Warbler, Sedge Wren and Wilson's Warbler. Sandhill Crane is now being seen here in summer and fall and is likely breeding. Rare birds reported from Alfred Bog include breeding Northern Hawk Owl. See also the Ottawa Field-Naturalists' Club's Alfred Bog, page for more information. Warning: Sewage lagoons generally do not welcome visitors. Liability insurance is behind much of their reluctance. In the past, they have often made an exception for birders. For some lagoons, the OFNC and/or independent birdwatchers have arranged special access with the operators or wardens. Contact the OFNC to find the current arrangements, if any. Some lagoons are partly visible without crossing the fences, though because of the berm construction, many are not visible from the road. Lagoons are generally not heavily patrolled or impassibly fenced, and when trespassers are unwelcome they are usually just asked to leave; so many birders assume the "No Trespassing" signs are for someone else (especially given past tolerance). Once in a while, especially in hunting season, hunters make the same assumption. They are less welcome than birders though and are often reported by the locals. After one of these incidents, patrols may be more frequent. The rules seem to change as often as the folks assigned to enforce them; some are more tolerant than others (some are downright helpful). Use courtesy and common sense. And when you park near a sewage lagoon, please don't block the access roads. Even without crossing the fences, a patient and competent birder can see many species as they fly into and out of the lagoons. 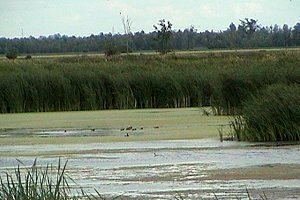 Directions from Alfred Bog, Site Description and Birding Information: While visiting the Alfred Bog, take time to check out the Alfred sewage lagoons where the usual array of waterfowl and shorebirds can be found in season. A new birding tower provides excellent viewing of the site. To reach the lagoons from the bog boardwalk, turn right or ENE onto Concession 11 Road and follow it as it turns north, then NNW. Continue for 1.5 km until it reaches Concession 10 Road, then turn right or ENE onto it and drive 2.0 km to Peat Moss Road. Turn left or NNW onto it and go about 3 km to the lagoons. They are on the right or east side of the road. Ruddy Duck (63 present July 19, 2003; 101 [61 adults and 40 young] on Aug. 5, 2006); American Coot (64 including young on Aug. 5, 2006); Common Moorhen, Virginia Rail and Sora all breed here. Redhead has bred here (2 pair in 2006, one in 2010). Good shorebirding is possible during migration. Red Knot, Stilt Sandpiper, Hudsonian Godwit, Red-necked Phalarope are some that have been seen here. Be sure to scan the sod farms along Peat Moss Road for Horned Lark in summer and shorebirds during migration (Whimbrel was seen here July 22, 1990). Also watch for Nelson's Sharp-tailed Sparrow in season. In the fall of 2006 Sandhill Cranes were seen at the back of the sod field on the west side of the road (17 - Sep. 20, 2006). Grasshopper Sparrow is also found along Peat Moss Road. Watch too for Gray Partridge in the area. Rare birds reported from Alfred Sewage Lagoons include Eared Grebe (Aug. 23, 2003), Marbled Godwit (May 29, 2004), Reeve (May 19, 2006), Ross's Goose (May 7-9, 2007), Mute Swan (Jun. 21-24, 2008). 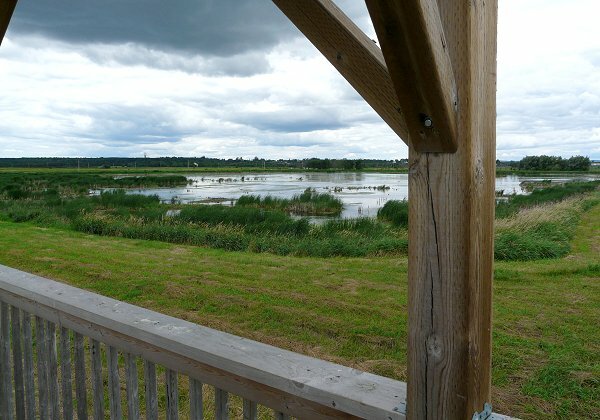 NEW ACCESS: The Township council of Alfred and Plantagenet have constructed an elevated viewing platform for birders at the north end of the lagoon. This tower provides an excellent view and is free. To actually get inside, new access procedures were put in place in May 2005, when a birder's gate with combination lock was installed. Birders must purchase a $20 annual permit to access the lagoons. This new seasonal permit allows access to the lagoons anytime from early spring to late fall, 7 days a week, and from dawn to dusk without needing to be accompanied by the by-law officer. Groups will need a $20 permit for the day. To find out when and where you can purchase your annual permit please phone Richard Villeneuve, Township of Alfred and Plantagenet, at (613) 679-2292. Return to Favourite Outlying Sites. Return to Birding Ottawa Table of Contents.